Tired of Seeing Your Dog Suffer? Your lovable friend has issues with seizures or tremors…and all you want is a solution that’s proven to work. Right? The leading cause of Dog Seizures are toxins like Chemicals, Mercury and Lead - these toxins also contained in vaccines! But don't expect your vet to tell you. Besides poor quality food, chronic and very serious health issues are emerging due to the shocking overuse of toxins and pet vaccines. How To Say Goodbye To Your Dogs Seizures: For Good! Our pets are now taking in toxins from a number of household items, and in record levels. There's also pesticides, herbicides, and lawn and garden chemicals from the environment. Then there's the Sprays, flea collars, over-vaccination and even everyday pet food. See this recent report. All these toxins are directly linked to seizures, in both people and pets. So it's common sense to get these confirmed toxins out of your pet - before giving your pet medication, which is even more toxic! Too many toxins today in too short of time! The major veterinary associations now agree that vaccinations can trigger all sorts of maladies, from seizures and allergies to cancer - but most pet caretakers (and many veterinarians, it seems) haven't gotten the word. ​More here. But luckily for you: now there’s a PROVEN & EFFECTIVE SOLUTION. We've tested and proven Detoxapet™ and we know it works. And it will work on your dog too "we guarantee it". Chemicals are easily absorbed through the pads on their feet, through their fur, and through their noses. Dogs and cats are cleaning themselves all the time -any noxious substances on pads or fur go right into the soft tissues where they're stored. 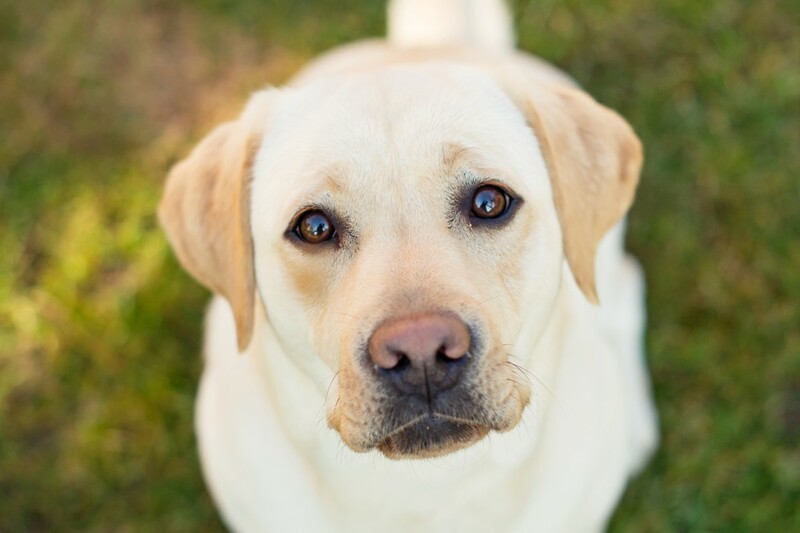 These are considered the real culprits behind your dog’s seizures. You may also see itching and scratching, which are toxins pushing out through the skin. Forward thinking vets and pet owners realize that the excessive numbers of vaccines routinely given to domestic pets are wreaking havoc on their health. These vaccines disrupt, dis-regulate, and in some cases virtually destroy an animal’s natural, innate immune function. Without a properly functioning immune system, an animal is much more vulnerable than it would be otherwise to a wide variety of health problems. Many pet owners would be surprised to learn that the dosage contained in one vaccine is the same regardless of the size or weight of the pet. This means that a 5 lb Chihuahua is given the exact same dosage as a 100 lb German Shepherd. It's no wonder seizures in dogs is at all time high. The Sad Truth Is That You Won't Hear This From : The Vet! From rashes and behavioral issues, to seizures and even vaccine injection site tumors, the list of adverse vaccine related health complications is long and varied. Many people don’t make the connection between the administration of a shot - and subsequent symptoms. In addition, the veterinary industry often does not acknowledge such a connection. Hence, adverse pet vaccine reactions often go unreported. One of the reasons why vaccines can cause damage to our pets is because of the toxic ingredients they often contain. Among these are: Mercury, Aluminum, Formaldehyde, Phenol, Viruses, Animal Organ Tissue. Most pet vaccines administered are done so via subcutaneous injection. This means that the shots deliver viruses, which are pathogenic materials, along with other toxins directly through the skin into the body’s underlying tissues. This circumvents the immune system and can trigger chronic autoimmune disorders. This includes ongoing inflammatory response conditions such as IBD (inflammatory bowel disease), arthritis, skin rashes and others. There's also the yearly "boosters"
Make an informed decision on your pet's behalf. .
Every time you get rid of ticks and fleas using chemicals, you're still using toxic chemicals on your pet. These anti-flea or tick shampoo, sprays or lotions are actually toxic venoms for cockroaches, and actually poison your pet. All these toxins have taken a toll, it's time to address it..
Pet food recalls have become a part of daily life for animal lovers. Mercury, Lead, Salmonella, beef thyroid hormone, and pentobarbital have topped the recall list this spring. Recalls are voluntary — companies decide if and when they issue one — and often use phrases like “elevated amount” of a contaminant, which leads one to assume that there's a “standard” amount of these contaminants in their products every day. 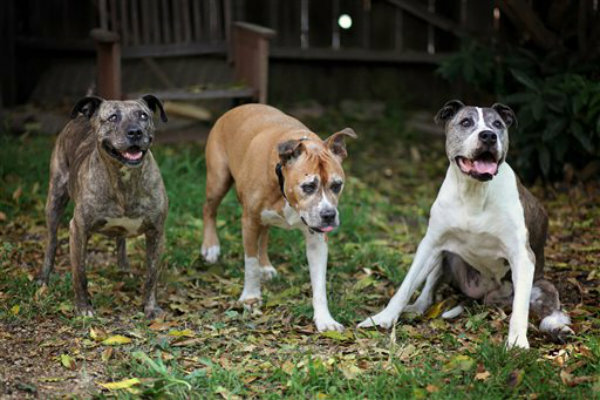 You Can Finally Say Goodbye To Your Dogs Seizures: For Good! Beginning in 2002, our dedication to science and research led us to conducting the world’s first published study on our own proprietary detoxification method, known as DETOXAMIN, used in 50 counties. Our years of expertise is incorporated into Detoxapet, We're confident that your pet will absolutely love Detoxapet, and you're gonna love the results. Detoxapet™ is loaded with anti-oxidants and special detoxifying agents that reduce oxidative stress in your dog. With reduced oxidative stress, your dog can automatically expel toxins from its body. As toxins are expelled, your dog’s core processes begin to efficiently regulate themselves, allowing them to live their life to the fullest. Detoxapet eliminates the built-up toxins that have accumulated in the liver, kidneys and colon in your own dog. 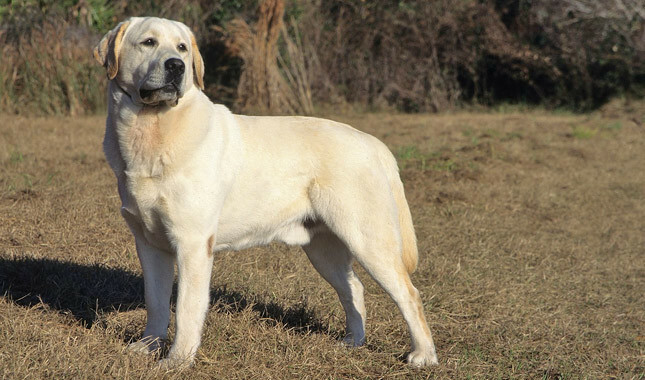 These are considered the real culprits behind all of your dog’s health issues. Luckily for your old furry best friend you can finally put an end to the suffering and restore a whole new level of vitality. Give them the gift of a healthy functioning liver, and a stronger immune system. And with their health restored on all levels, he or she will experience a more full and healthy life. Detoxapet™ Pet Detox Formulation provides all of the elements for a complete pet detoxification and is used as ongoing maintenance that ensures gastrointestinal and immune health. It contains a variety of antioxidant-rich plant extracts which support detoxification enzyme activity in the liver and other organs together with several important vitamins that are consumed by cells when they detoxify xenobiotic compounds, and must be replenished. It also contains several agents that trap the eliminated toxins so that they can be safely excreted and do not re-enter the system. Last it contains a range of ingredients that strengthen and support the gastrointestinal and immune systems to facilitate restoration of full cellular function for a healthy, happy pet. Easy-to-use powder: Detoxapet is easy, just add one-scoop into your pet's food and mix. ​All-natural bacon-cheddar flavor: it is formulated with a vegan, bacon-cheddar flavor derived from high ORAC fruit extracts and natural flavor stabilizers. Powerful fast-acting complete formula: we guarantee that Detoxapet stops your pet's seizures, as well as giving your pet a new lease on life. 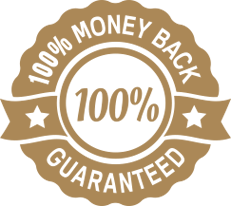 It's backed by our 100% Satisfaction & Effectiveness Guarantee, if your not satisfied - we'll give you a refund. 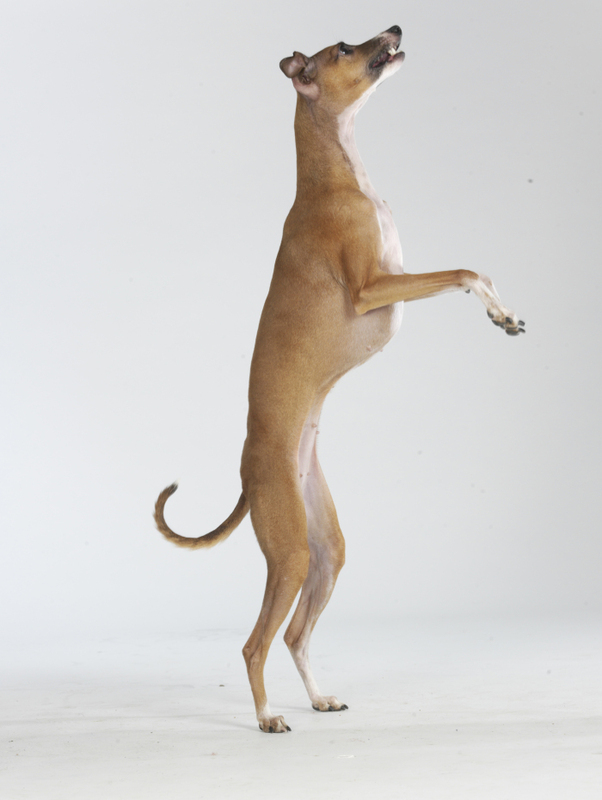 “I have an Italian Greyhound, Cloe, who has Cushing’s disease. She was having tremors and started falling when she tried to walk. I was desperate to find something that would help improve her health, it broke my heart to see her like this. I came across Detox A Pet, and after researching it I thought I would give it a try. I noticed a difference right away, each day she kept improving, she is now walking and the tremors are gone. I am so fortunate to have come across this product; I can see a marked improvement in her health, plus she loves the bacon cheddar flavor. I don’t like wasting my time or money on a product that does not produce results or where the customer service is useless, this is definitely not the case here. I am very impressed by the results of Detox A Pet, plus their customer service is excellent, very caring. I only wish I had found this product sooner, it has made such an improvement in my dog’s health and energy level. I highly recommend it!" “Seizures stopped plus new muscle and shiny coat..."
“We are please to report back excellent results. Our lab mix is about 10 years old and he was having seizures about twice a month. This was our main concern initially. They would last about 3 minutes, but it would take about 10-15 minutes before he was able to get on his feet again. The vets we took him to could not help at all, unfortunately. We noticed that the seizures stopped almost immediately, as well as dramatic improvements in energy and digestion. He has now had about 3-4 containers of Detoxapet, what we noticed after about one month was even more impressive! He has actually gained muscle around his neck, legs, and looks much younger! His coat looks shiny new again, and we notice more new hair growth. His mood is also more stable and does not swing like it used to. 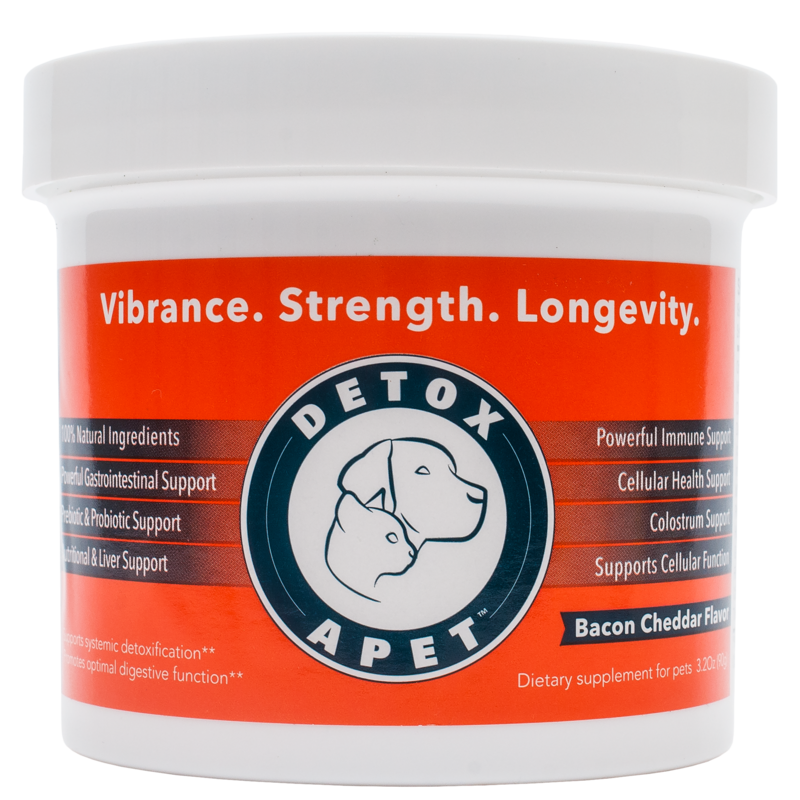 We are very happy and want to thank Detoxapet, we highly recommend this product!" “I waited a month to post this review, as I wanted to see what changes I would see. I have a 12.5 year old mixed breed with very arthritic back hips, some liver issues (due to long term anti-inflammatory use) and has been losing muscle mass (despite high-protein diet. She was shedding excessively and had dry skin, even with fish oil supplements given. After 1 month, her coat has stopped shedding as much and no more dry skin. I noticed she has less plaque on her teeth. She is much more mobile, even though winter is the hardest season for her usually. She has been up and moving more in general. Her liver has shown improvement too, as her bloodwork just showed (using this and a second milk thistle supplement), without the pharmaceuticals the vet wanted to give her. Detoxapet is definitely a staple in our house and I give to my other dogs for one week a month, just as a general detox! Love this product. Thank you!" Detoxapet™ just works. We know it. Our customers know it as well. By addressing the real cause behind your dog's seizures and other health problems, and by flushing out its toxins, Detoxapet™ will surely help your dog eliminate seizures and the suffering, while also enjoying better health and longevity, with visible results in as little as 10 days. We stand behind our product and offer a full 30 day money back guarantee, if you feel Detoxapet™ didn’t work for your dog. “Nicky is jumping up the stairs again. “Nearly a year ago, my then 12-year-old mixed breed dog, NIkki, developed a partial bowel obstruction and severe liver inflammation (blood results so high they were off the charts). After a night receiving fluids, she came home from the vet’s office and slowly recovered. She was placed on a supplement that was to help with the liver inflammation. On my own, I ordered a couple of other different products that would support the liver with different ingredients – Detoxapet was one of them. I gave her a couple of doses but with it being a powder and her improving, I didn’t stick with it. The product sat on the counter with her other supplements (for arthritis). She has always been a slender dog with lots of hair (probable sheltie/husky mix) and I noticed that her weight was not increasing and you could feel just skin over her bones, so I started giving her a half a container of wet dog food a day along with her dry kibble. After doing this for a month, it occurred to me that I could use up the product by putting Detoxapet into the wet dog food. Wow! what a difference! She has pretty arthritic legs but she started leaping up and down the short staircase we have to go outside via the family room. Our other young dog has appreciated that she is back to playing with him for a couple of minutes at a time. It has definitely given this now 13 1/2 year old dog a new lease on life! I will definitely share this product with others including my dog’s vet." “I rescued a blonde Lab/Pit mix two years ago. He has had nothing but skin problems from the day I rescued him. I’ve searched high and low for a cure with no success. I came across Detoxapet back in January 2018. I ordered it and gave my dog 2 scoops in the morning because Jack is a big boy. Within 9 days I noticed his hair growing back. I continue to give it to him and every day I am absolutely amazed with his progress. He’s more energetic and is more playful. Thank you Detoxapet!!!" There needs to be more awareness about this pervasive problem. People need to know that besides acute conditions, the damage caused by these toxins and vaccines are implicated implicated in longer term, chronic ailments. Until the level of toxic contaminants are regulated, companies and products aren’t going to change — so what's needed is for dog owners to take control, detoxify their pets, and prevent future toxic exposures. Contains important vitamins consumed by cells when they detoxify xenobiotic compounds, and must be replenished. Strengthens digestive and immune functions. Repairs cellular damage. Supports new muscle, hair and skin growth. You are fully protected by our 100% Satisfaction and Effectiveness Guarantee. We want our Detoxapet to actually work! If you don't get [seizures in your dog stopped] by [30 days of using], just let us know and we'll send you a prompt refund. 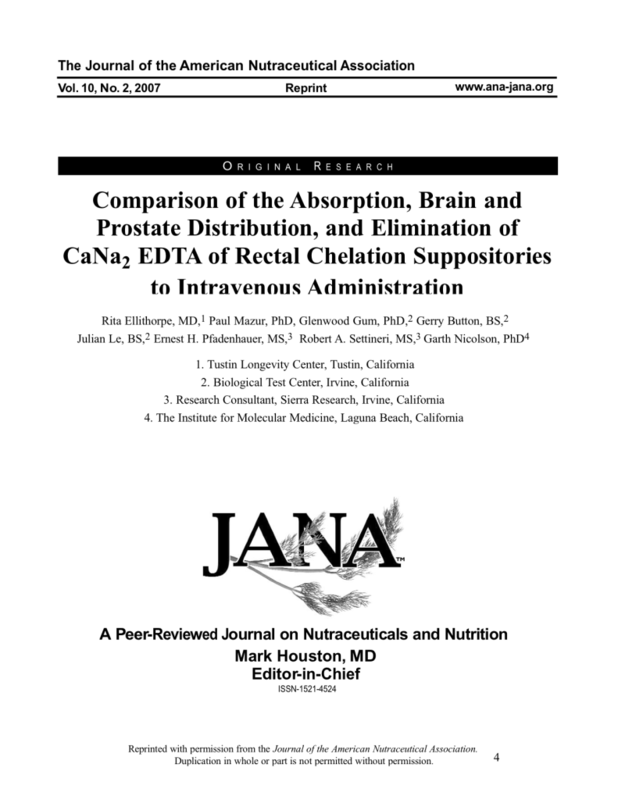 How do I know Detoxapet is working? 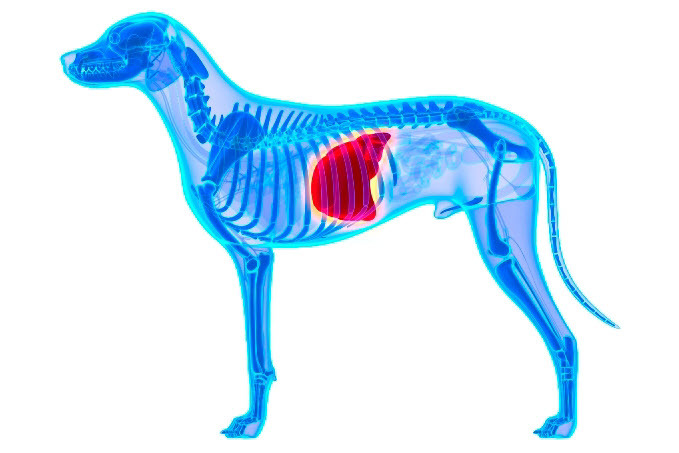 Within just 30 days of giving your dog its daily dose of Detoxapet™, you will notice very visible and telling results. Don’t see results after 30 days? Give us a call to seek out a full refund. We stand behind our product, 100%! We are more than willing to address customer inquiries, doubts, concerns & questions. Feel free to reach us at support@detoxapet.com or by calling us at 801-876-1783. My pet has allergies, can I give it Detoxapet? When we created Detoxapet™, we knew it will be given to dogs in less than ideal health conditions. This is why Detoxapet™ uses a proprietary formula with low allergenicity. Formulated with non-GMO, 100% vegan ingredients free of animal, gelatin, wheat, sugar, dairy and SLS products, Detoxapet™ just will not cause allergies in your dog. In fact, Detoxapet™ reduces allergic reactions affecting your pet, as the active ingredients in Detoxapet™ go into overdrive to rid the body of toxins, one of the primary reasons triggering allergies in the first place. Does Detoxapet contain any ingredients from China? ALL ingredients used in Detoxapet™ are sourced and manufactured from within the United States of America. We understand how important the health of your pet is to you and we assure you that there are no ingredients sourced from China. Yes. Detoxapet™ is an all-natural, 100% vegan product with no side effects. P.S. : Detoxapet eliminates the built-up toxins that have accumulated in the liver, kidneys and colon in your own dog. 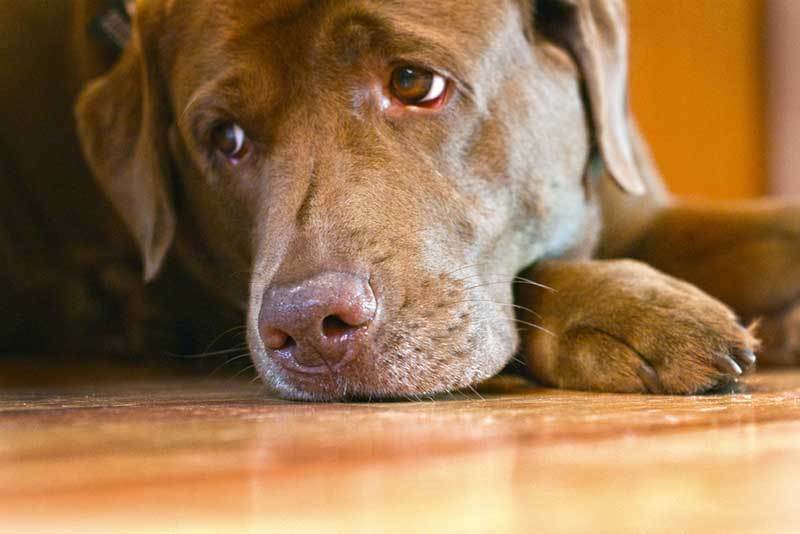 These are considered the real culprits behind all of your dog’s health issues. Luckily for your old furry best friend you can finally put an end to the suffering and restore a whole new level of vitality. Yes, I want to my dog to start getting Detoxapets [benefits] now!